Soundings: April Issue – Eco Alianza de Loreto | Loreto, B.C.S. 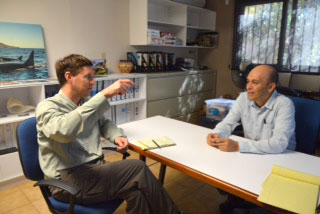 Jason Vorderstrasse, Chief of the Political/Economic Section at the U.S. Consulate in Tijuana, stopped by Eco-Alianza late last month for a meeting and discussion with Eco-Alianza Executive President Hugo Quintero. Jason was instrumental in setting the stage to initiate the international Sister Cities and Sister Parks relationships between Loreto and Ventura, California. He continued fostering the program and helping to facilitate approvals until the final sisterhood documents were signed by the presidents of both México and the United States late last year. Although he will soon move to a new posting with the U.S. State Department, Jason said Loreto will always have a special place in his heart. And in fact, immediately after his meeting with Hugo he began his vacation time, right here in Loreto! Jason has left big shoes to fill at the Consulate in Tijuana, but we’ll certainly welcome his replacement, Bridget Premont, as soon as she wraps up her current U.S. State Department position in Brussels, Belgium. The mission of Eco-Alianza specifically supports preserving the “natural and cultural environment” around us, because the two are inextricably connected in Loreto. So what better way to express this than to host an exhibit of provocative paintings by Loreto artist Alejandro Curiel, whose work explores the relationships between humans and nature? 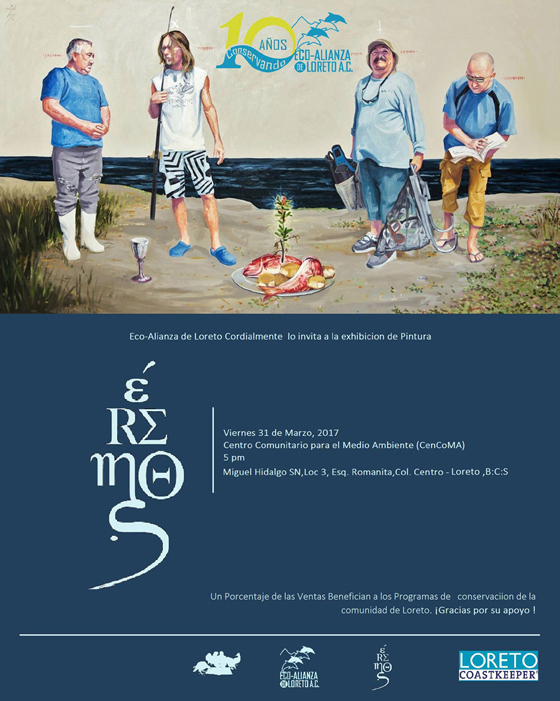 Curiel has produced a collection of 50 paintings titled Éremos, and has been showing an extract of the collection this month in the first-ever art exhibit at Eco-Alianza’s CenCoMA headquarters in downtown Loreto. And you and your friends are invited to a free reception with the artist this Friday, April 21 at 5:00 p.m., with the paintings available for purchase. A portion of proceeds goes to support Eco-Alianza programs. Curiel is well known for his mural in the stairway at city hall, and has recently had shows throughout BCS, as well as Mexico City. 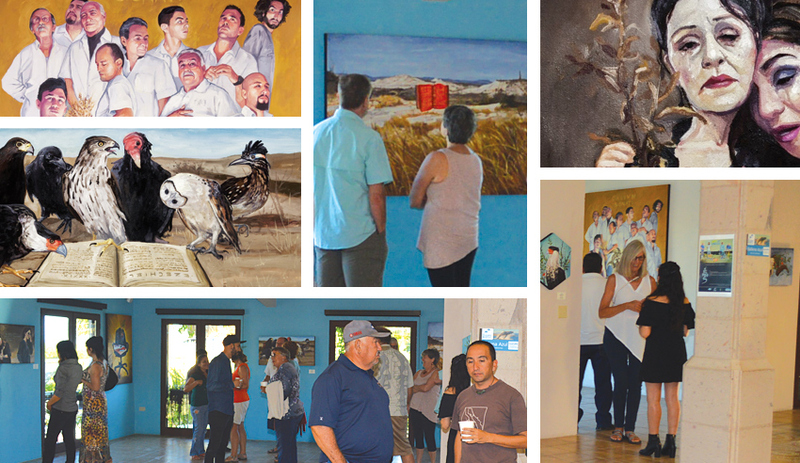 Eco-Alianza Executive President Hugo Quintero said he expects more art exhibitions in the future, especially as the organization expands with more suitable exhibit space for art. He hopes the efforts will help local artists and contribute to local culture, as well as encouraging conservation messages through various artistic media. Additionally, Hugo said, he foresees individual artists or groups of artists benefitting from the business incubator programs that Eco-Alianza is developing. Possibly also exchange experiences through our Sister City, Ventura, CA. Artwork will be available for sale at Éremos closing reception. Regarding his collection of paintings, Alejandro says they are inspired by the Greek word ρημοςἔ, meaning “desert, uninhabited, desolated, a barren land.” He said that biblically it refers to the East and South of Palestine, but in his paintings, to Baja. Alejandro said he aims to blend desert landscape and Biblical texts, highlighting the Sudcalifornian ambiance with a contemporary approach. “The main idea is to show the place we live and its people, wildlife and of course the human drama exposed in the stories, the vicissitudes of the gullible, the quest for freedom, and futility of life,” he said. Paintings in the exhibit include “pure local people in a non-ordinary context,” including at least two Eco-Alianza staff members! 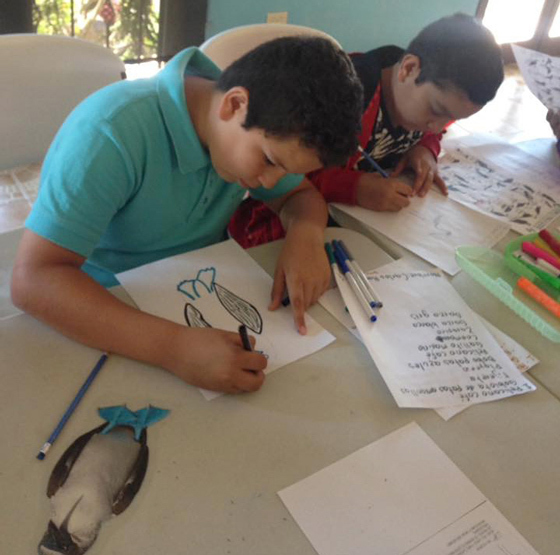 Students participate in the Bird Festival, engaging in artwork at Eco-Alianza. There’s been a lot of press recently about all the blue whales in Loreto, and the huge success of the Blue Whale Festival, which certainly showed that people here love nature (and love coming here to view nature). 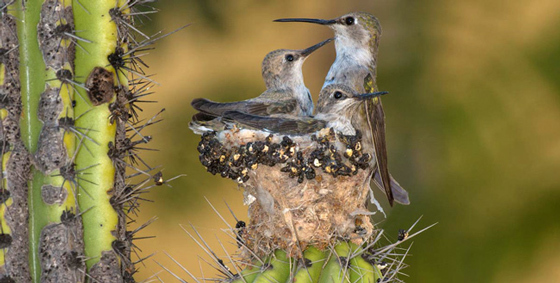 Now a lot of local naturalists’ eyes have been turning to the skies, and to trees and land-based habitats, as Loreto’s first annual Festival of Birds and Wetlands this month celebrated the amazing diversity of avian life here. The festival would not have been possible without the inspiration and organizational efforts of Mariana Urías and Casa Palmas Altas, and the dozens of volunteers who offered their (in several cases expert) services and assistance! 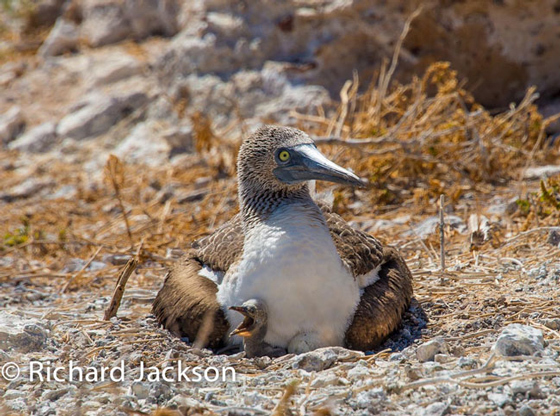 Activities included bird walks in Loreto and Loreto Bay, educational workshops, a photography class, talks about wetlands, protected species and other subjects, murals, art exercises, and a beach cleanup (learn more about this in next month’s Soundings). Although many “winter birds” in Loreto had already left for their northern migration, festival participants seemed quite pleased with the variety that was still here, as well as with how much they learned about our avian friends and how to enjoy them. Thanks to PhD candidate Jaclyn Aliperti, bat knowledge in Loreto took a huge leap forward at the end of March. “Jackie” presented two programs on successive nights (one in English, the other in Spanish) about her research in the Loreto area, specifically about the pallid bat. 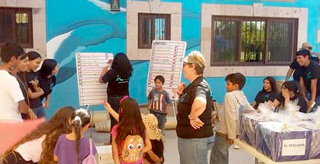 The programs included general information about worldwide bats, as well as their conservation challenges, and followed Jackie’s scientific research in several Baja California Sur locations. Both programs drew standing-room-only audiences, with dozens of questions from the crowd and answers from the expert. A huge thank you to Jackie, who flew here from UC Davis specifically to present these programs at Eco-Alianza. 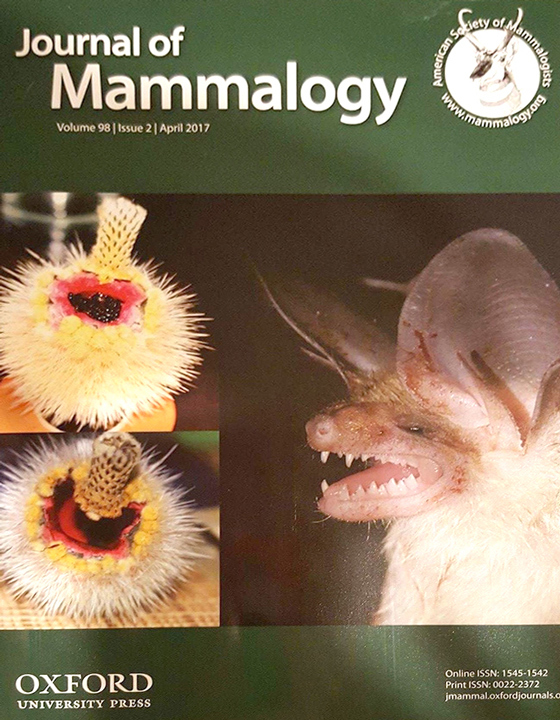 And congratulations are in order, as her study now has been published, not just inside the U.S.-based Journal of Mammalogy, but also gracing its cover! Eco-Alianza’s newest program, which supports entrepreneurs by “incubating” their local, sustainable businesses, already has gained recognition on a statewide level. Executive President Hugo Quintero recently traveled to La Paz to be appointed to a federally-supported Network of Support for Entrepreneurship that is active throughout Baja California Sur. The board includes representatives from banks, hotel associations, universities, governments, and business incubators. It is supported by the federal Secretary of the Economy and the National Entrepreneurship Institute. 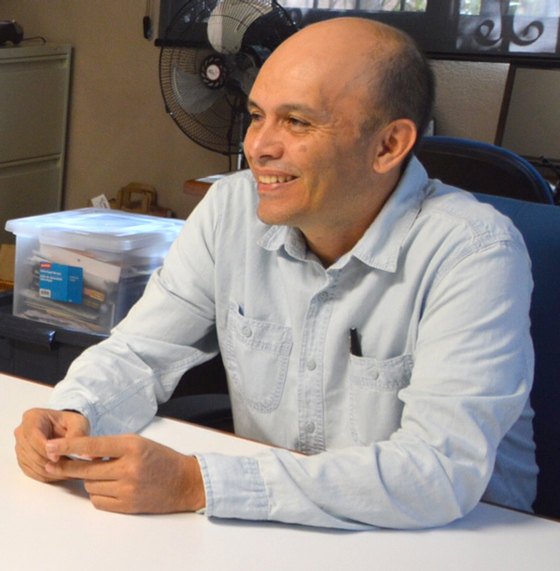 Hugo said his appointment is a recognition of Eco-Alianza’s work and that he is excited to join this group that fosters entrepreneurship through trainings, media, mentorships, and other programs. 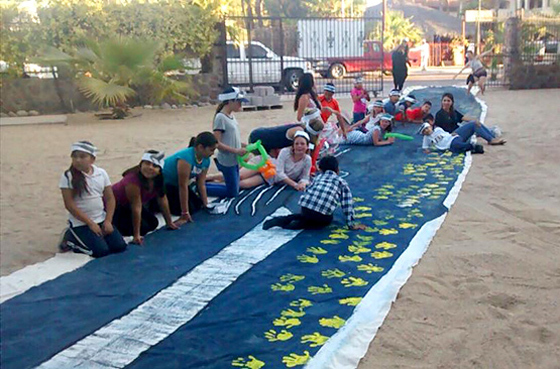 Students from Ventura and Loreto get “hands-on” with lifesize depiction of Blue Whale. As part of our Sister City relationship with Ventura, CA, a group of 10 students, along with 10 family members and teachers, visited Loreto earlier this month. The students from Anacapa Middle School in Ventura are part of an immersion program in which students are taught lessons in both English and Spanish – so their trip to Loreto was a great opportunity to practice their Spanish in real-life situations. While they were here they visited Isla Coronados, took a tour of the city plaza area and the Misión, visited the Casa de Cultura where they learned a dance with local students, went whale watching, enjoyed a sea mammal workshop at Eco-Alianza, and traveled to San Javier and to a site to view cave art. Of course in their down time they also enjoyed several local restaurants and shops. As part of their itinerary, the group also visited a local school where they made more connections with local children, participating in several activities that are sure to be the start of ongoing relationships (which is what exchange experience trips are all about)! 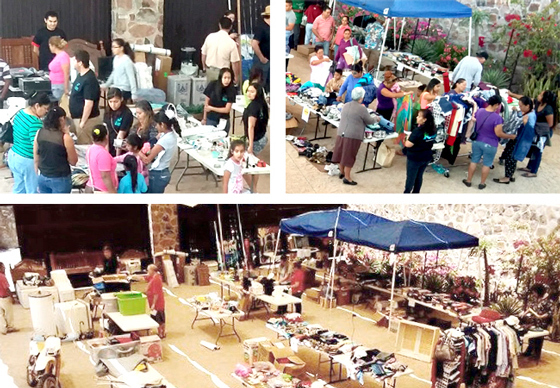 Eco-Alianza’s fifth annual Garage Sale and Raffle had something for everyone. Thank you to everyone who participated in our 5th annual Garage Sale and Raffle earlier this month – our Sponsors, Supporters, item donors, volunteers, and of course everyone who came to find some bargains (and support Eco-Alianza’s environmental education programs). There are few events that embrace the “Reduce, Re-Use, Recycle” of conservation more fully than a garage sale. And beyond that, the event is always a wonderful social event, where part-year visitors to Loreto mingle with local Loretanos and everyone is in a festive mood! Forward this Issue of Soundings! Please forward this newsletter. It is entirely free, and you don’t have to be a contributing member of Eco-Alianza to receive it. We publish it separately in English and Spanish. Notice – if you are receiving this newsletter in English, and would like to forward it to friends who only speak Spanish, let us know – we can send you both versions. Or vice-versa.